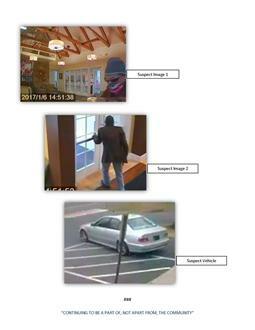 Hanover, VA – On Friday, January 6, 2017, at approximately 2:54 p.m., the Sheriff’s Office responded to the EVB Bank located in the 8100 block of Mechanicsville Turnpike for a reported robbery. The white male suspect approached a teller, displayed a handgun, and took an undisclosed amount of money. The suspect is described as an older white male wearing a dark colored stocking cap, and had his face partially covered. The suspect fled the area in a silver colored four door sedan.